Well, our two year mark came and went this October, and we were so pleasantly busy with work and fun in New Hampshire that we didn’t take the time to call it out. But in the aftermath of Thanksgiving and with our stay here ending, it seems appropriate to take a few minutes to talk about what we’ve accomplished and where we are at now. When we hit the road, this blog was something I updated inconsistently, with sometimes daily and sometimes monthly posts. Now I have a weekly post that I’m quite disciplined about sticking to, and though the format varies, I think we’ve honed in on what it covers with more certainty now. I’ve also kept the same level of discipline with my ice cream blog. The Botanical Garden in Denver is one of the most beautiful we’ve seen in our travels. When we hit the road, we had no clue about booking. We may still be learning (constantly), but we’ve had gigs from senior centers to libraries to coffee houses to bars to churches to yoga classes, and we’ve taught lessons as well as performed in communities from Tucson to Orlando, from Boulder to Maine. We’ve made several good friends that we remain in contact with, and we’ve been able to maintain and strengthen existing relationships through meetups with friends and family who have moved or traveled while we’ve been on the road. One of the nicer monthly sites we’ve enjoyed. We’ve taught an introduction to ukulele class for older adults, an eight class series, that has now been tested successfully with four different groups of adults. We’ll soon have a great promotional video that we can use to promote those classes too. We’ve also proven that Ross has a wonderful ambient music set for yoga classes and that Ross and I make a great music performing team. We’ve experimented with composing together as well. We’ve sampled some of our country’s best gluten-free eats (hello, Colorado!) and have had outstanding ice cream in cities and towns across the country. We spent almost six months of our lives at Disney World, spent many days at the Arizona-Sonora Desert Museum and fell in love with both Silver City, New Mexico and Fort Collins, Colorado. Playing gigs as we travel is as good as it gets. Especially when they throw in amazing food and drinks! As we say goodbye to New Hampshire, we are incredibly thankful of all of the family and friends who’ve gone out of their way to see us (and spoil us!) during our time here. Thank you to everyone who purchased a meal for us, collaborated with us, hosted us and everything else in between. And to those we weren’t able to see this time around, we look forward to visiting with you when we return – or when you meet us out on the road! One of the many events we loved attending at Disney World with our annual pass. We do have to admit that we’re happy to say goodbye to the snow, the ice and especially to the frustration that comes from plans that are disrupted due to weather. We’re looking forward to a warmer winter, with lots of sun and daytime highs in the 50s and 60s, and while we’ll miss our family and friends, the quiet and relative isolation of the communities we’ll be returning to in New Mexico will give us the perfect opportunity to hunker down and build our businesses. As we head into year three, it is with a renewed intention to build successful remote careers on our own terms. Thank you for coming along for the ride! p.s. I may spend a future post exploring some of the fun we had here in New Hampshire it. There’s been far too much of it to cover in one post! 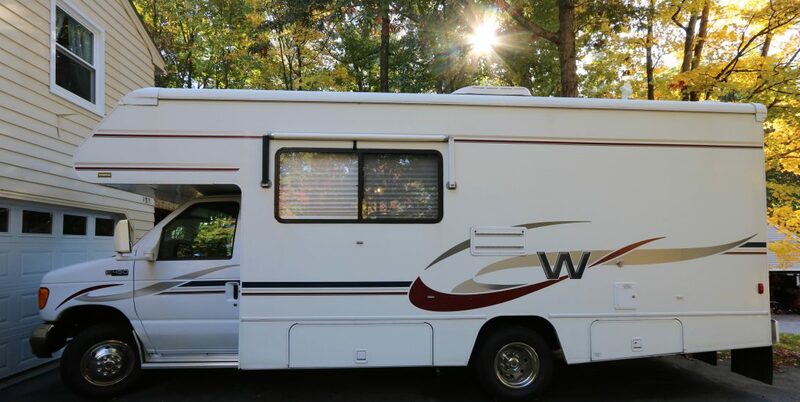 Camping in a parking lot in your RV makes some people nervous. But honestly, it’s kind of our bread and butter when we’re traveling somewhere! It’s cheap and convenient. Learn more about the how-tos and safety concerns here! It’s hard to believe, but we’re only in New Hampshire for a few more weeks! We’re looking ahead to a warm summer in the Southwest, with the plan to spend most of our time in New Mexico, with visits to Tucson and Austin as well. I recently wrote this blog about ten spots that are great for snowbirds like us who want to escape winter. I hope reading about these spots warms you up today! Ross and I have been so, so busy! This past weekend was memorable because it gave us some well-earned time off. We spent time with some of our closest friends and family, and it was wonderful! (I saw my friends Tom and John as well as my brother Robbie, and Ross spent time with his best friend, Pat. I also saw my mom for a bit.) Thanks to everyone who is making time to see us during our stay. It’s made our time here so special. I recently wrote a post for Outdoorsy with some nice autumn campfire treats. I hope they inspire you to enjoy your culinary adventures this season! When you leave your hometown for whatever it is you’re looking for, you accept there are things you will miss. Jamie and I left the familiar behind for something new, something unknown. We left behind green summers and cold white winters. We left favorite haunts like Amphora and Maia Papaya. We left behind students and friends and family. There are so many things to miss about home but our focus was on the adventures before us. And what adventures we’ve had! This year alone we’ve spent an excessive amount of time at Disney World, adopted an amazing fuzzy travel companion, visited New Mexico and extensively explored Fort Collins. We met new friends, ate delicious food, and played our music all along the way. We never stopped missing all the things we love about New Hampshire but there is so much to see in this country. It’s almost overwhelming (in a good way) to think about how much we’ve done in such a short time. As we approached New England in late September the landscape grew more and more familiar. Reliance on GPS lessened as I found myself on roads I’d driven time and again. There’s comfort in the familiar – even the places that drove me nuts when I lived here. Coming home is a reset – like going to sleep allows the brain to process all the information of the day, spending time with friends and family, sharing our stories and taking part of all our favorite parts of home cleanses our minds in anticipation of what is to come. The next leg of our adventure is just around the corner, but right now I’m focused on visiting the coast, eating a bunch of seafood and hanging out with friends as long as I can while I’m here. You know, all that stuff that I’m going to miss. Ross, Jamie, Mom and Grampy enjoy NH’s favorite chain, Common Man, in Concord, NH.